For a limited time, we vacuum seal our freshest Almonds and other select nuts in Mason Jars for holiday gift giving. For a limited time, Eatnuts.com packages our freshest Almonds and other popular natural nuts in vacuum sealed Mason Jars. 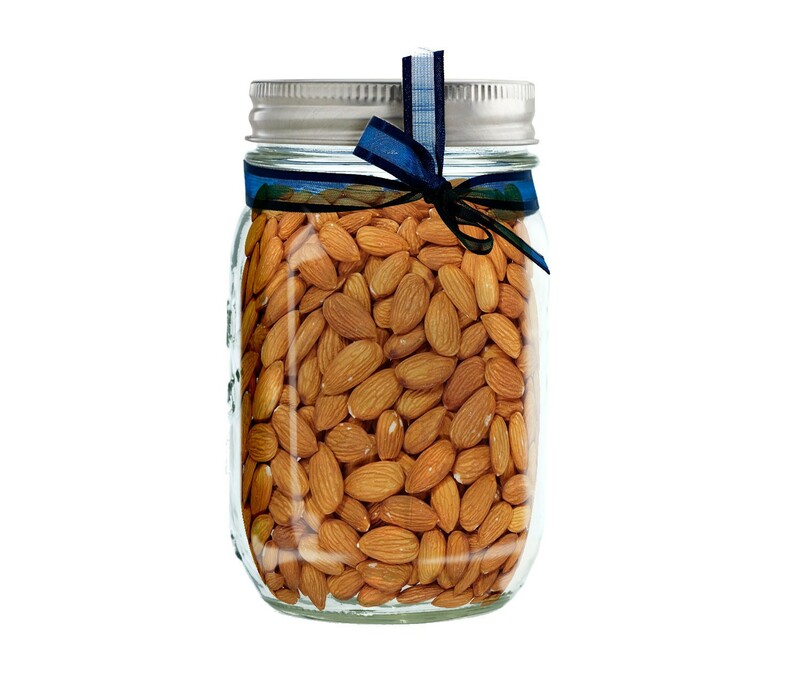 Stock up and have Whole Almond Mason Jars on hand for last minute holiday gifts. Don't be caught empty handed this holiday. Stock pantries of those you love or bring holiday party nuts in Mason Jars, the timeless, practical container that is always appreciated. A home warming gift that complements any kitchen or pantry, Mason Jar Almonds are attractive to display and delicious to eat. Whole Almonds Mason Jars make great holiday gifts. Almonds have nutritional benefits like magnesium, potassium, and are full of antioxidants. When you eat the almonds with their skin you get more than double of the antioxidant dose. Just another example of the exponential benefits of eating whole foods. When we lack magnesium it impacts our heart health, and almonds are a great source of magnesium. The insufficient magnesium levels in our body act as a channel blocker making it difficult for our bodies to absorb calcium. Just 1/4 cup of almonds contain 62mg of Magnesium and 162mg of Potassium. The potassium is an important electrolyte that is connected to nerve transmission.